We could all use a little clarity when it comes to Hardship Exemptions and Meaningful Use. This week on the LTC Management blog, Rod Baird shares some information and ideas regarding this very confusing, but very important topic for physicians and extenders working in the PA/LTC setting. Let’s give CMS a round of applause for fixing the bungled roll-out of HealthCare.gov. I don’t think Secretary Sibelius was the person to blame for the out-of-the-gate blunder, but it was nice to watch as the highest official available paid the price. Could we make this a pattern? Since the Insurance Market Place is now ancient history, at least until next fall, CMS is refocusing on the hundreds of other programs they manage. April has seen a major series of initiatives that affect PA/LTC Physicians and the provider community. The next few blog posts will focus on updated regulatory issues. If you are a LTPAC Physician – are you eligible to request an EHR Meaningful Use Hardship Exemption? As usual, none of the CMS information is written from the perspective of a LTPAC Physician, so we’ve created the flow sheet below to help guide our own support staff when talking with physicians. Physicians who fail to demonstrate EHR Meaningful Use during 2014 will suffer a <1%> penalty on 2015 Medicare Part B payments. Physicians who perform a majority of their ambulatory work in a SNF/NF setting are probably eligible for the HARDSHIP EXEMPTION. The form is confusing and AMDA is working directly with CMS to get a more PA/LTC physician focused explanation. Right now, the biggest need is to alert every Physician, or their employer, that the application deadline is July 1, 2014. P.S. – PA/LTC physicians will request the exemption under section 3.3 – Lack of control over the availability of Certified EHR Technology. Thanks to our colleague Jean Butcher, MBA, we are aware of some apparent certification hanky-panky. Jean is a LTC Physician practice management consultant in Houston. One of her clients has demonstrated Meaningful Use, Stage 1, under an EHR’s 2011 Certification. 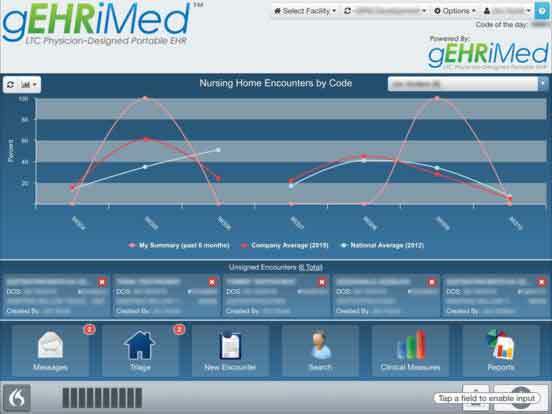 That EHR has been ‘modularly’ certified for 2014, and advertises itself as such. They promise a “late Spring 2014” date for Complete Certification. Assuming that happens, the product can be used for CY 2014 attestation, and penalty avoidance. However, if they aren’t Certified, and the provider is not trained on any updates by 7/1/2014, it will be too late to avoid Penalties! Practices trying to avoid the 2015 MU penalty must report by 10/1/2014. That means the last possible ‘start date’ is 7/1/2014. I’m not sure how to get a quarters’ worth of data submitted on a single day – but it is possible. The EHR vendors aren’t really to blame for this – CCHIT (Certification Commission for Health Info Technology), the largest EHR certification vendor, have exited the EHR certification business and the remaining vendors are now swamped. If an EHR vendor wasn’t already scheduled for certification testing when CCHIT closed its doors, then many were left out in the cold. We don’t think it ever hurts the physician to take precautions. To our knowledge, applying for the exemption while your vendor is not fully certified is appropriate. If they receive Complete Certification by the 7/1/14 deadline, go ahead with plans to demonstrate MU.More to come on this topic – stay tuned.